If you doubt that Cary Grant is one of the smoothest and most watchable of all the great film stars, then I suggest you sample this new DVD box set from Universal. Opening with one of Grant’s best-loved comedies, the 1938 classic “Bringing Up Baby” (making its DVD debut), it offers proof positive that Grant was not just a handsome figure of a man but a gifted light comedian and a compelling scene stealer. Those looking for his Hitchcock thrillers won’t find any in this package because it’s devoted to the comedic side of Grant’s screen persona and as such it’s an irresistible treat. The remaining three films in this package are Indiscreet (1958), My Favourite Wife(1940) and Operation Petticoat (1959). The set comes in an attractive fold-out cruci-pak replete with replicas of the original theatrical posters and informative production notes from Ken Barnes – whose DVD production skills are evident throughout - making this a very satisfying box of goodies. CARY GRANT – THE COLLECTION is to be recommended to anyone who enjoys screwball romantic comedies, a genre in which Cary Grant was the undisputed master. ( which was remade as “Move Over Darling” with Doris Day and James Garner) and “Operation Petticoat” a naval comedy co-starring Tony Curtis (which the notes tell us was Grant’s biggest box office hit). A set to treasure. If you like Cary Grant (and who doesn’t?) you’ll be interested in CARY GRANT-THE COLLECTION (Universal). It offers a nice balance of four of his films covering a span of 21 years. Two in black and white – “Bringing Up Baby” (1938) and “My Favourite Wife” (1940) and two in colour “Indiscreet” (1958) and “Operation Petticoat” (1959). Cary is supported by an impressive list of co-stars including Katherine Hepburn, Irene Dunne, Ingrid Bergman and Tony Curtis. The whole set shows how effortlessly Grant could play comedy be it slapstick or witty repartee. The set is nicely packaged with replicas of the original posters and extensive production notes by Ken Barnes which, as always, are finely detailed and entertaining to read. Recommended. Singapore, Zanzibar, Morocco and Utopia that see our hapless duo doing everything from being playboys trying to forget lost loves, to being caught out by slick con-women while lost in the jungle. Very funny throughout all four films…and Hope and Crosby play off each other well as one of the classic film comedy duos. The restored prints are vibrant and the addition of a 30-minute featurettes and the likes of Humphrey Bogart…. Four classic movies for £35 is not to be sniffed at. Bob Hope, Bing Crosby and Dorothy Lamour made seven Road movies. The best were the early ones such Morocco (1942 and Utopia (1945)….Crosby has never been given credit for being the fall guy who has to pick up the pieces as well as Lamour, if he’s lucky, in his role as casual crooner. Coming back to these movies after 60 years, you cannot help but be impressed by the cool assurance of his performances. If Hope is the rat, Crosby is the rock. Bing Crosby brought a fine voice and plenty of charm; Dorothy Lamour added glamour and Bob Hope did the rest. For 22 years this Hollywood trio were on the road to somewhere. Crosby always played the smooth con-man, Hope was his cowardly wisecracking partner. Both spent most of the movies chasing Lamour. A new box set showcases the best of the series. We head out on the Road To Singapore, Zanzibar, Utopia and Morocco (which received two Oscar nominations and is generally regarded as the best in the series). THE ROAD TO SINGAPORE, ZANZIBAR, MOROCCO AND UTOPIA. This, it goes without saying, a sheer delight from beginning to end…. As this is a Ken Barnes production, you know there will be plenty of added value and in this case there is a set of art cards, a Hollywood Victory Caravan feature, Bing Crosby at the Stage Door Canteen in Piccadilly and lots of other features. Having said that, the films themselves are of course the main attraction, and these pristine prints remind us what a great team this was, how full of good humour the films were and what fine songs were in each film. This sort of entertainment is in short supply today unfortunately but who cares when you can dip into a treasure chest like this ? FRED AND GINGER - THE COLLECTION. Box set, four discs, Universal Video. Follow The Fleet, Shall We Dance, and Carefree – in one box set. The title scene in Top Hat, Dancing Cheek To Cheek and the dog-walking scene in Shall We Dance are alone probably worth the price. The rest are just joyous extras and you can enjoy the comic skills of the late Edward Everett Horton as well. 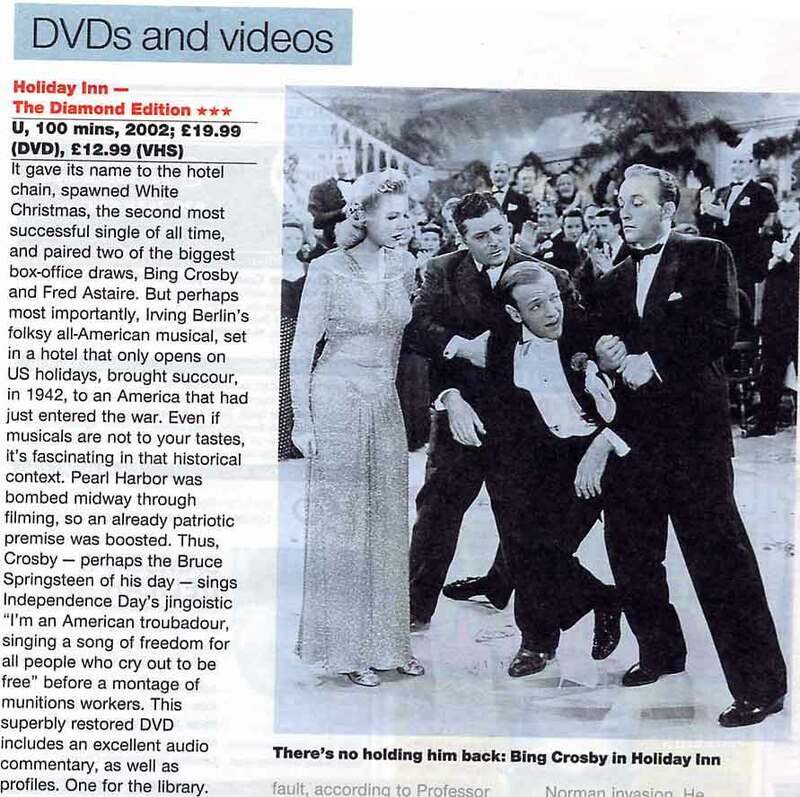 On DVD you also get introductions by Astaire’s daughter, Ava and notes from the film historian, Ken Barnes. Watching Astaire and Rogers dance together makes one simultaneously elated at the sight of such joyful artistry and melancholic at the thought of something the cinema has lost forever. ..Fred and Ginger made nine films together for RKO in the 1930s and this delightful box set contains four. Top Hat, the 1935 film many consider their finest achievement, along with Follow The Fleet, Shall We Dance and Carefree. …Oh, how lucky filmgoers were then. …the extras include good production notes and biographies. FRED AND GINGER; THE COLLECTION. Forget the frenetic and frantic editing of dance numbers in Moulin Rouge and Chicago and relish the genuine talents of Fred Astaire and Ginger Rogers. With this box set of four of their most famous movies, you can see what real dancing is all about. Full length body shots and uninterrupted takes without modern day kinetic jump-cuts. This is an excellent collection of Fred and Ginger musicals, and each film is introduced by Fred’s daughter, Ava. ‘Let’s Cal The Whole Thing Off,’ ‘They Can’t Take That Away From Me’ (SHALL WE DANCE) and ‘Change Partners’ (CAREFREE) are more than enough compensation, as are the dance routines. Ava Astaire, Fred’s daughter, introduces each film and Ken Barnes has added extensive background notes. …an indispensable release that should be an integral part of everyone’s DVD collection. If YOU love Frank Capra movies but feel you’ve seen It’s A Wonderful Life too often, this enterprising DVD release may be the answer. Here’s Gary Cooper as a penniless former baseball player hired to help in a devious goodwill drive…. A slightly flawed film from Frank Capra…this is still one to be savoured…. A phoney letter in a newspaper from a John Doe causes such a reaction that someone is required to play the part. ..The audio Commentary by film historian Ken Barnes also includes an audio interview with Capra. …Meet.. Mr. Cooper/Miss Stanwyck/Mr. Capra are three very well informed 15-minute documentaries….Restoration Comparison tells of the hard work in producing this good DVD ‘print’, and an impressive work it is. A two-hour version of the 1941 classic that starred Gary Cooper. …The final scenes are gripping……superbly shot, it is tense until the very end. Directed by Frank Capra, this is one of Coop’s greatest roles and he was the best around to play the average Joe, but of course he was no average actor. Special features include details of the digital restoration of the film. Biographies on Capra, Cooper and Stanwyck. These are complete features, not just thumbnails with, with clips and still from a range of their features. ….It is clear that much time has been taken over these special features, unlike many that are released with a few minor items attached. 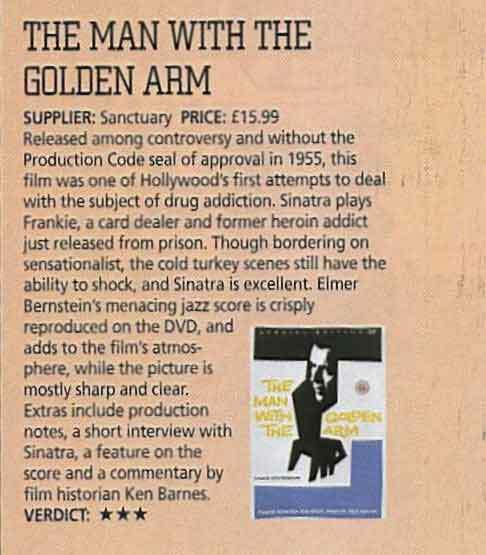 Well presented by the Laureate Company, skilfully guided by Ken Barnes, this DVD presents a true classic in a fresh light. If you don’t remember this Sinatra curiosity it may be because the famed crooner had it withdrawn from circulation in 1963 as it was allegedly viewed by Lee Harvey Oswald days before JFK’s assassination. Frank plays an assassin posing as an FBI agent who is planning to kill the President. ….there’s plenty to enjoy in this tightly woven thriller. Commentary: Film historian Ken Barnes waxes lyrical about the movie. Featurettes: Focusing on Sinatra the Man, the Actor, The singer from fellow performer Rich Little’s viewpoint. Production Background: Nice and detailed. The sleepy town of Suddenly is roused when the Benson household is disrupted by crazed assassin John Baron ( Sinatra) who decides that it would provide the perfect place from which to assassinate the visiting US President. An eco drama before its time, this fast-moving adventure from 1952 stars Kirk Douglas as Jim Fallon, a ruthless timber boss who takes his crew to Northern California with the intention of felling the giant redwood trees in a get-rich-quick scheme. Opposing him is a religious sect who want the trees preserved for the sake of the territory’s natural resources. Tensions run high as other factions seek to take over. After the murder of a friend, a reformed Fallon changes sides and the story is wrapped up with two spectacular action sequences involving a runaway train and the blowing up of a dam. Douglas is fine in a role that calls for more action than acting but the script has one or two good lines and the Technicolor transfer is clean and good to look at. Jim Fallon ( Kirk Douglas) has his eye on some California real estate. He has made his money through lumber and wants to fell the giant redwood trees. He owes a syndicate some 250,000 dollars and needs to fell the trees to prove that “money grows on trees.” Other lumber concerns want in and the local religious colony want to save trees entirely. The good-looking Sister Chadwick (Eve Miller) is the first representative he meets of the colony. As the claims are held up by the local land agent a land war looks like breaking out. ….Naturally there is a big finish with a dam burst and the colonists holding rifles. The special features tell us that Kirk wanted out of his contract with Warners and so offered to make a picture for no fee. He still gives his all in an action-packed ( well for the ‘50s) extravaganza. There are some early political suggestions about conservation and green issues. Although the two DVDs listed below are not in the Laureate Collection, they were produced by Ken Barnes and the Laureate team with restoration and mastering by Phoenix Video Ltd. The two reviews – the first of many - came from the same source - BBC Homepage Entertainment. Picture: Blessed with some stunning cinematography, a lot of work has gone into presenting what would appear to be a good quality print. Odd moments of grain are just that, in a transfer that shaves years off the film’s age. Sound: Even on the 1985 Thorn EMI rental release, this film came with an impressive surround track. The new 5.1 mix for this disc does all the right things, adding subwoofer support to both the haunting Vangelis track and weight to the storm scenes. Audio Commentary One: Director Roger Donaldson, producer Bernie Williams and production designer John Graysmark are reunited for this look back in time, and it’s a fascinating chat. Audio Commentary Two: This solo commentary is with maritime historian, Stephen Walters, who acted as historical adviser on the film. Making of Documentary: This is an original documentary made at the time of shooting, and is well worth watching. During the ‘80s you learned to lower your expectations of any Stephen King book that had been turned into a movie. ….The one exception was the thrilling “The Dead Zone ” starring a superbly skittish Christopher Walken as a man who has been blessed, or rather cursed, with the ability to see into the future. If you haven’t seen this movie or would love to see to revisit it, then this new DVD is the best way to do it. Picture: As with most of Cronenberg’s early movies, the style is low in colour, especially with the snowy settings of the movie. The result on video always looked somewhat unpleasant, so the sharp, crisp image on offer here is very welcome indeed. Sound: A gold star goes to the placement around the speakers of the music score in this 5.1 mix. It’s beautifully done and really adds to the atmosphere of the film. Effects such as the car crash are a little low on bass, but it’s a minor point for work like this. Audio Commentary: If there’s one thing that’s becoming apparent it’s that most directors deliver lousy commentaries. So, what we have here is a chat between Stephen Jones, author of the “Illustrated Stephen King Movie Guide” and Kim Newman, film critic and Cronenberg expert. Both come loaded with information and imparted in an easy-going and often entertaining way. Booklet: …Sanctuary have produced a lovely 21-page booklet written by Stephen Jones. There’s extensive notes on the film’s production history, cast and crew profiles, an article on Cronenberg plus stills, international poster art and some pages from the script. One point to note, this release is a whole lot better than the US region 1 release, perhaps a reason why this disc is region free. Almar Haflidason BBC Homepage Entertainment. LAUREATE’S first three releases SECOND CHORUS, ROYAL WEDDING & CHARADE have all been acclaimed by the press. “..a fast-paced and engaging entertainment with many amusing moments...a couple of sequences showing what a fine band Shaw had, and some top class song and dance from Astaire. The black and white print is sharp and the sound is crisp. “ This1950 MGM musical, with a score by Burton Lane and Alan Jay Lerner, is usually remembered for the famous scene in which Fred Astaire dances on the walls and ceiling. This, and many other facets of its production are discussed in the fascinating feature in which Ken Barnes chats with Fred’s daughter, Ava.. There are some entertaining song and dance numbers, notably I Lost My Hat In Haiti and the superbly titled How Could You Believe Me When I Said I Love You (When you know I’ve Been a Liar All My Life ). PICTURE: Hardly any scratching, but colours are a little blurred - more to do with the quality of early colour film rather than the transfer itself. SPECIAL EFFECT FEATURE See how the set was rotated in a massive drum to make it appear that Astaire was so in love he could dance across the ceiling. Just like Lionel Ritchie. PHOTO GALLERY, CAST PROFILES The profiles are exemplary in the detail and deserve a gold star. COMMENTARY: Film historian, Ken Barnes hosts an informative chat, which includes input from the late Henry Mancini and Johnny Mercer. CAST AND CREW PROFILES: Excellent and detailed. Other DVD producers please note. “ The sharpness of the whole enterprise, from the dialogue, to the music and the costumes makes Charade so much more than just a buy for Hepburn and Grant completists. A hidden delight. There are also cast and crew biographies ands an audio commentary by Barnes.